Democratic socialists like Sen. Bernie Sanders, I-Vt., and Rep.-elect Alexandria Ocasio-Cortez, D-N.Y., would have us believe that Big Government funded by extremely high taxes – in countries like France – can create fair and just societies with widespread prosperity, little if any poverty, and a happy and contended population. May I suggest that Sanders and Ocasio-Cortez take the next available flight to Paris and explain this to the French people? While far-left U.S. politicians like Sanders and Ocasio-Cortez are trying to push America ever leftward to be more like France, many French citizens don’t agree that their society is so wonderful – and they’re rioting to make their point. Last Saturday, Paris saw some of the worst rioting in decades, set off by protesters angered by a wildly unpopular fuel tax and other problems plaguing France. And this Saturday more rioting is expected in France. Around the country 89,000 police officers will be on duty and armored vehicles will be deployed in Paris. As a precautionary measure, the Eiffel Tower – a magnet for tourists from around the world – will be closed Saturday. The French fuel tax increase – since called off by unpopular President Emmanuel Macron – was supposed to help combat global warming by getting people to drive less. But a lot of the French would prefer lower taxes. As the French would say, sacre bleu! Who could have possibly guessed that? Interestingly, a lot of Democrats in the U.S. also see higher energy taxes as a way to reduce climate change by having fewer cars on the road driving fewer miles, and by reducing the number of power plants burning fossil fuels. If they ever force though a big energy tax increase you can bet it will be greeted by howls of protest from the American public – perhaps even rioting on this side of the Atlantic. Although the French fuel tax hike has been cancelled, the French protests have since expanded to demand a lot of other things – including bigger tax cuts, a minimum pension, a lower retirement age and additional generous social benefits. In other words, the French protesters seem to be saying the welfare state is fine – in fact, they want it to hand out even more costly benefits – but they want lower taxes at the same time. Uh, do they teach arithmetic in France? French students, many in high school, have joined the protests as well. Macron wants universities to be able to use high school exam results and university entrance exams to select which students to admit to degree programs that have more students than they can handle. Currently, all French high school students who pass their final exams are allowed to enter their local public university and study for any degree they wish. What could be wrong with that? Well, an astounding 60 percent of French students drop out before the end of their first year in college. It doesn’t take a degree in economics to figure out the French are sick of their high tax rates – and angry about efforts to increase taxes even more. In France the personal income tax rate is 45 percent, and a value-added tax of 20 percent is levied on the increased value of a product at each stage of production or distribution for most items. On top of that, there are a host of taxes on other things, including fuel. No wonder the French people want more and more government benefits. By the time they’re done paying their enormous taxes, they don’t have much money left to take care of their family expenses. I’m not in the habit of giving Democrats in our country advice, but I would urge them to campaign in 2020 on duplicating France’s tax structure. It’s a safe bet that this would be the most effective way possible to guarantee the election of huge Republican majorities in the House and Senate, and get another four years in the White House for our tax-cutting President Trump. In addition to fighting climate change, the now-abandoned French fuel tax hike was designed to strengthen Big Government, by giving government greater power to force the French out of their cars and into public transportation – like herding French sheep. Is it any wonder that so many people in France have decided to not go so quietly into the slaughterhouse of economic and personal freedom – and instead revolted? The American left-wing media have downplayed the protests in France because the protests don’t fit the scripted story they want to tell. Europe is supposed to be enlightened and oh-so sophisticated. Europe is supposed to be the role model for the way the United States should behave as a member of the global community. Europe is supposed to be the place where citizens understand the need to downplay individual liberties and instead pursue the common good, including saving the planet from the evils of fossil fuels. 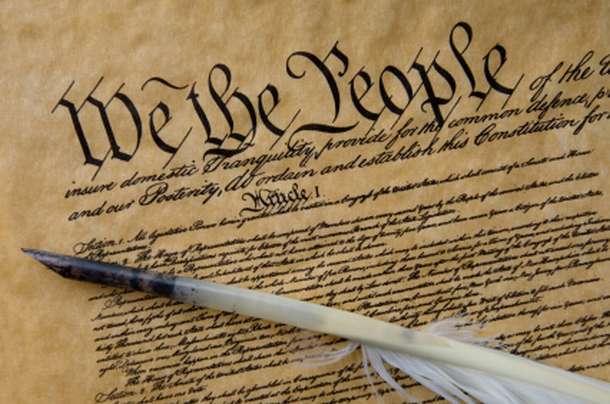 Liberty, Fraternity and Equality – to the brink. Since the end of WWII, France’s steady movement away from Western ideas of individual liberty and self-determination – and toward collectivist action and conformance – has created a people overly dependent on government, hobbled by crippling taxes and lacking in individual initiative. Some of the French protesters have been heard to chant “We want Trump.” Why on Earth would these enlightened souls of France be calling for a president our media portray as a pariah to the world? The protesters want President Trump because some of them recognize that in 2016 the American people found the courage to elect a president who would be willing to stand up against the united forces of Marxism, globalism and political correctness. They see the courage that President Trump has shown in fighting back challenges from Democrats, Republicans, the media, celebrities and activist groups. The French protesters see President Trump fighting and they see America winning. They make to Make France Great Again. But right now, while America is booming, France is burning. 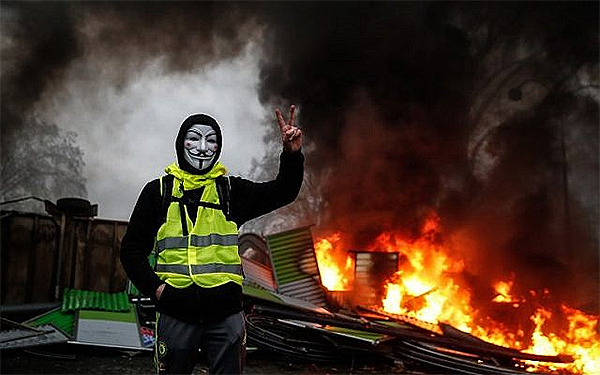 French unrest could very well foreshadow general European unrest, where open border policies and collectivist economic practices are leading to increasing pressure being applied to citizens in general and the middle class in particular. But if France is Europe’s canary in the coal mine, could Europe be the same for the United States? Americans needs to understand that the election of Donald Trump has forestalled our slide into the abyss of cultural Marxism and the surrendering of our national heritage and identity to that of the global community. The problem is that President Trump is singular and the threats we face are plural. Europe has had a head start on the United States on the road to serfdom. We have been stalking the Europeans from behind and at a distance. Since it is the holiday season, I am channeling Charles Dickens and remembering the encounter Ebenezer Scrooge had with the spirit of Christmas future. As we know, Scrooge could change and so can we. The Spirit of Western Civilization’s Future has just shared a vision with us. Heed it. Alter it. Posted in Freedoms and tagged France, Socialism.